Come on and test me! YA-ARRR! Okay, so I'm not a pirate, but I can play one pretty darn well. 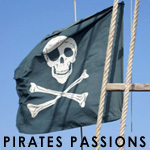 I love the romanticism of the pirate as portrayed on film and TV, but also the ideas of freedom. To go and take what you please. Gold, food, ships, women, all the good plunder. YARR! I also love listening the Captain Dan & The Scurvy Crew. Does pixierose93 belong in this group?